Since I was driving out to Houston for Lone Star, I decided to head out to New Orleans for a vacation. Nick and Stephanie were in Lafayette, Louisiana at the time, so I stopped and ate lunch with them at Julien’s Famous Cajun Style Poboys Store No 1. Unfortunately, the store closed early for the holidays. 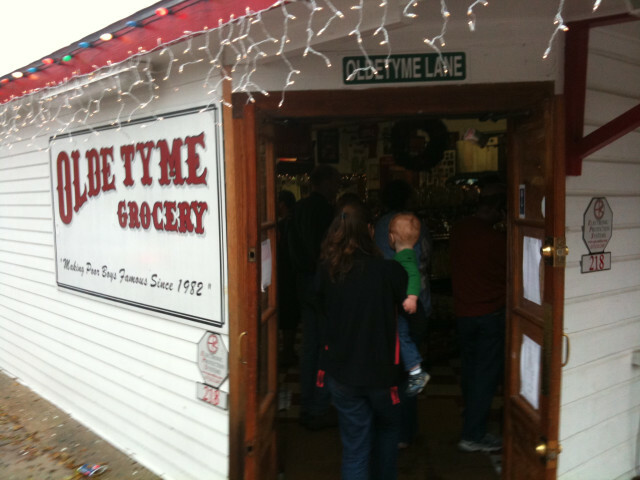 So we all headed over to Olde Tyme Grocery. I arrived at the Sheraton on Canal Street later during the day. Unfortunately, it was Christmas Eve and many restaurants were closed. 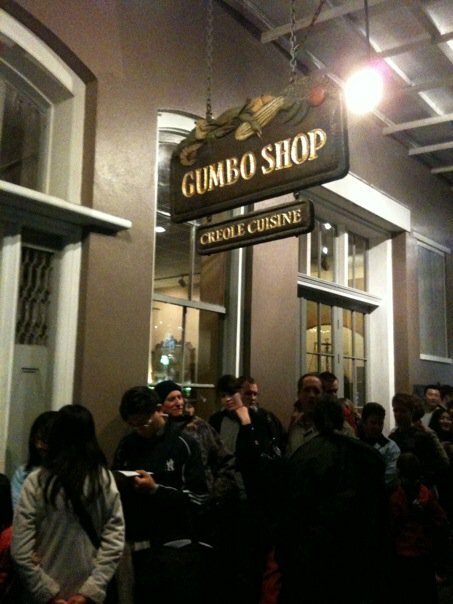 But, I stumbled upon the Gumbo Shop. The line was down the street at 6:30! But I lucked out when they were asking for two people or less and everyone else was in a group with more than that. The hotel was situated on the edge of the French Quarter and close to the river. And the view from the window was not so bad. Christmas day was low-key. Not many places were open. I had an Alligator Poboy at Original Pierre Maspero’s. And I had Creole crawfish combo with a sweet potato cream stout at La Bayou. 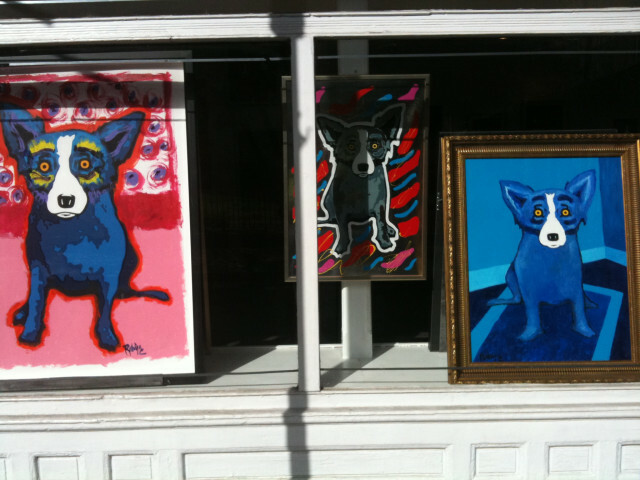 This was following me around New Orleans. Including in my hotel. It was in all colors and decorations. Very LSD trippy. Cafe Du Monde Coffee Stand opened up. 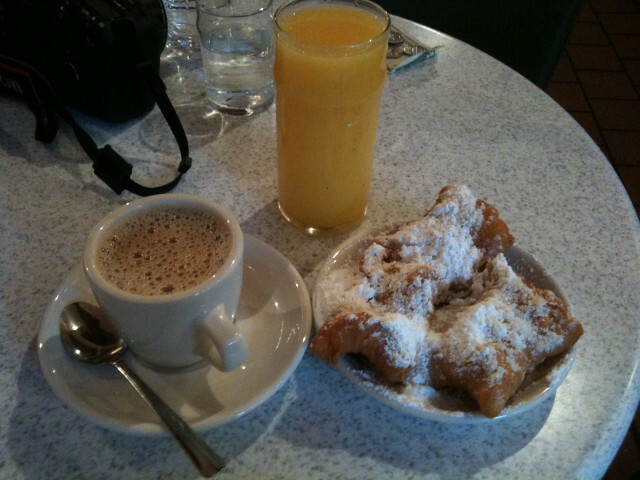 I had Cafe au lait, orange juice, & beignets for breakfast for the next four days. Definitely splurged on that one over the vacation! Lunch was a Creole sausage pizza at Remoulade. Which was okay. I went to the Aquarium of the Americas and took lots of pictures. Taking pictures of the fish is rather difficult. The lighting is really poor. You are forced to use a grainy, high-ISO speed. And the fish constantly move. Which means that the camera needs to be good at tracking focus when the depth-of-field is thin. I also got to watch as someone proposed to his girlfriend where they were feeding the penguins. Apparently, she thought they were going to watch a feeding up close but they took a penguin and put a ring around it and handed it to her. For dinner, I went to Emeril’s Restaurant and had Crater Lake Blue Cheese (Rogue Creamery, Oregon) & Honey, Andouille crusted Texas Redfish, and sticky toffee cranberry bread pudding. It was okay. Next time, I would try Emeril’s NOLA restaurant. On Sunday, I was tempted to buy a ticket to the New Orleans Saints game. But, instead, I took the streetcar down the St. Charles Ave in the Garden district. All the way down to Camellia Grill. Where I ordered Harry’s Yankee Special. Watching the cooks make omelets on the grill was impressive. I should have ordered one. I walked back to the Audubon Zoo. For dinner, I went to Broussard’s Restaurant and had the Salmon Trout de la Salle with the Crepes Brenan. It was pretty awful. On Monday, I went to Mother’s Restaurant and had the Famous Ferdi Special (2/3rd size). The line was crazy long. I was a little worried that I might not make the river cruise in time. But I made it. I took the Paddlewheeler Creole Queen to the Chalmette Battlefield. It was a beautiful day out. Although it was a little cold out. We went up the Mississippi river a short way. The battlefield was pretty bare. It was basically a wide open field. There was a monument under construction and a house that sold some gifts and a couple of cannons along a tiny ridge. I did have one scare when the boat sounded its one and only whistle call that it was going to leave and I was way out on the other side. I ran directly to the boat with no problems though (well, except for getting my feet wet). Creole Queen Paddleboat from Mark Hamzy on Vimeo. Dinner was at K-Paul’s Louisiana Kitchen. 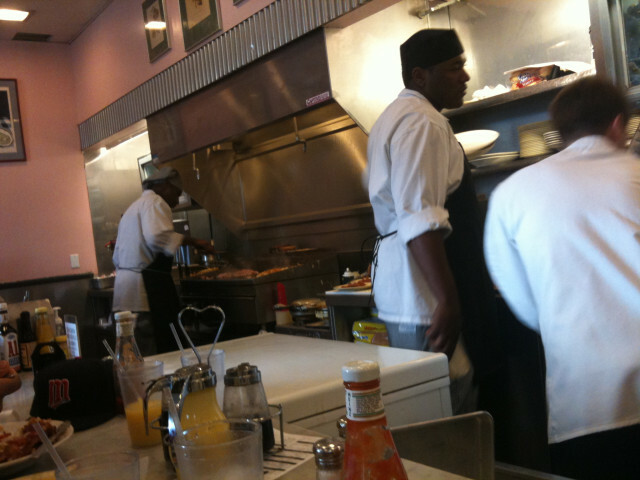 It was by far the best food in New Orleans! The breads, Blackened Louisiana Drum, and bread pudding were excellent. The only thing which marred the event was that the fire alarm went off briefly during dessert. But I would have walked out to safety with my pudding. 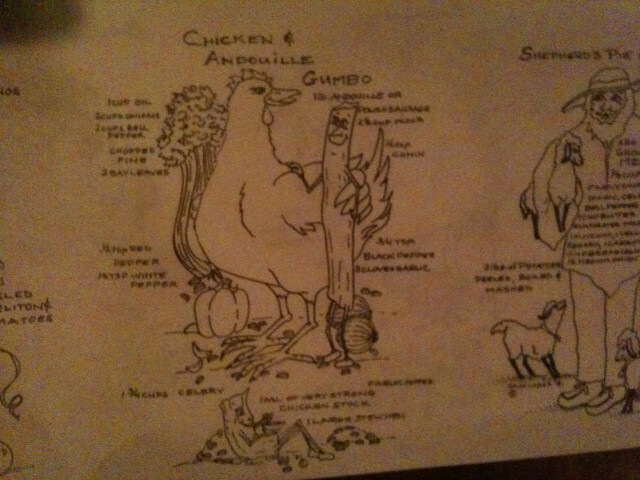 I also loved the whimsical food related artwork in the restaurant. 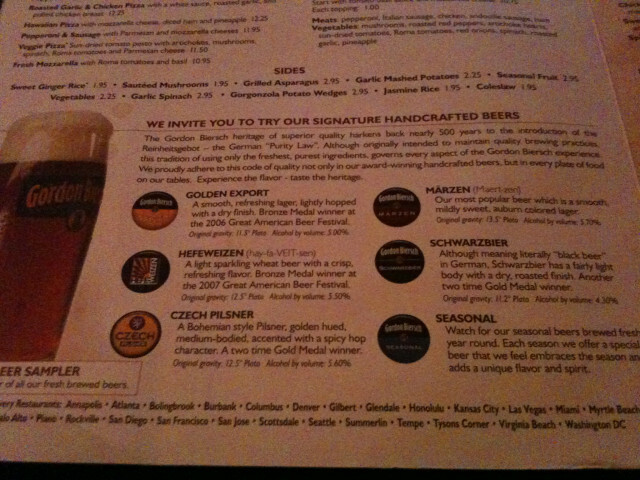 I went to Gordon Biersch brewery and tasted their sampler. On Tuesday I walked along St. Charles Ave and took pictures of the houses. Man, there are some beautiful homes along the way. With a lot of different architectures. But what was more shocking was the devastation just blocks away. I wanted to take some pictures of one of the cemeteries, Lafayette Cemetery Number 2. However, the neighborhood turned rather dangerous looking quickly. I took the memory card out of my camera and put it in my pocket and the camera strap off around my neck so that I would still have my pictures if the camera was stolen. The cemetery was also sadly never repaired after Katrina. For lunch, I finally had the opportunity to eat at Green Goddess. I had wanted to eat here since I came here but the place had been closed until today. The South Indian Savory Ivory lentel pancakes were good! I finally had a Hurricane at Pat O’Brien’s Bar. And then went to eat at Brennan’s Restaurant. I had the Pepper Fillet with Barbecued Shrimp and the Bananas Foster. Sadly, they won’t cook the Bananas Foster tableside. So you can see the spectacle of lighting the thing on fire. The nightlife was incredible on Burbon Street. The place was always packed every night. There was a improvisational band playing close to Canal Street. Harrah’s Casino was also pretty close to where I was. They had some games of Texas Hold’em including a limit game of 4/8. Unfortunately, they had no comps for playing the game! Grrr. Definitely not a good deal at all. This entry was posted in Interesting on December 29, 2009 by Mark.